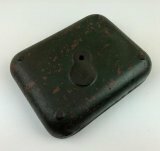 This is a quality cast iron replacement starting handle suitable for most Lister engines requiring a 1.5" crank starting handle. 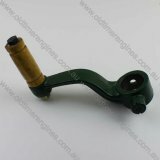 It is known be used on Lister A & B Juniors, HR, HRW, LD, LR, SL, SR, ST and SW.
Crank handle suitable for Lister CS diesel engines, may also be suitable for other stationary engines with 2" diameter crankshafts. These handles have a sprung loaded ratchet pin which is reversible to suit either direction depending on the rotation of your engine. 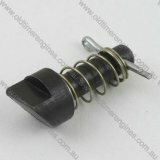 A quality replacement ratchet pin, spring and split pin for many Lister starting handles, known to fit Lister CS 2" Starting Handles, Lister L & J 1.75" & 1.5" Starting Handles, Lister A & B Junior 1.5" Starting Handles and many others.